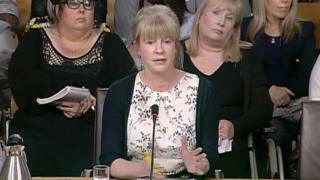 Health Secretary Shona Robison has asked an expert to examine a review into the safety of mesh implants. Many women have questioned the safety of the implants, which are used to treat incontinence, after suffering debilitating side effects. Two patients sitting on the original review group quit in protest at what they said was a watered-down report. Now independent expert Alison Britton, a professor of healthcare and medical law, will examine the final report. Ms Robison told Holyrood's public petitions committee that Prof Britton, from Glasgow Caledonian University, would examine the process by which the report came to its conclusions. She told MSPs: "Professor Britton will produce a report on how the independent review process was undertaken and importantly what lessons can be learned in the future." Image caption More than 400 women are currently taking legal action against Scottish health boards and manufacturers as a result of mesh implant surgery. The report concluded procedures should not be offered routinely to women with pelvic organ prolapse. It recommended patients be offered a range of treatments and given the information to make "informed choices". The report also said reporting of adverse events should be mandatory. Ms Robison confirmed the recommendations would continue to be implemented despite calls from campaigners for an all-out ban. The health secretary said the government did not have the power to ban the procedures as that lay with UK regulatory body the Medicines and Healthcare Products Regulatory Agency. In other evidence, the chairwoman of the independent review Tracey Gillies apologised for failing to unite all panel members around the review's controversial final report. Ms Gillies took over as chairwoman of the independent review of transvaginal mesh implants in its final stages towards the end of last year. It emerged she had no conversations with previous chairwoman Lesley Wilkie, who resigned for personal reasons. Her evidence was punctuated by cries of "shame on you" and "rubbish" from a packed public gallery which included some women who had suffered painful and debilitating complications as a result of the procedure. Ms Gillies said her task had been "almost mission impossible from the beginning". She said: "It was clear that there were strongly-held views of difference at the point that I came in, so one could say more fool me for agreeing to chair this. "This is not something that most people would have ... welcomed would be the wrong word, but it's clearly going to be a very difficult thing and I personally have reflected and feel disappointed that I have not achieved what I would have set out to do, which would have been to bring this in in consensus. Olive McIlroy and Elaine Holmes - who had both suffered complications as a result of the surgery - quit the review group earlier this year, saying they felt "dismayed and disgusted" at the publication of the independent report. It was claimed that parts of the final report had been removed. Following their resignations, it emerged that a consultant also quit the expert group over concerns about the final draft of the report. Over the past 20 years, more than 20,000 women in Scotland have had mesh or tape implants but some have suffered painful and debilitating complications. There are more than 400 women currently taking legal action against Scottish health boards and manufacturers as a result of mesh implant surgery.